Andrea Saraniti was used in three of the matches in the present term. Having been born in 1988, on July 23, Andrea Saraniti's age of 30 makes him senior to the average player of US Lecce. In Serie B (Italy), US Lecce is in second position. As for winning percentages, he won with US Lecce 100% of their home matches (50% in total) in Serie B. 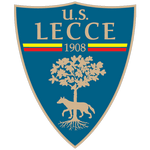 US Lecce enjoys a 3-game winning streak during the last 5 games of the current season. Just five days ago Andrea Saraniti played his latest match. He wears the number 18 strip at US Lecce. He received not one single penalty throughout his entire career. While being substituted more in than out this season, the contrary occured the year before. Andrea Saraniti is a one-club-player, as US Lecce is his first and only place where he has played as pro. He is playing as forward in US Lecce together with Andrea La Mantia, Simone Palombi, Marco Tumminello, Filippo Falco and Alessandro Avantaggiato.